Learn more Take me to the store! On Kickstarter now! 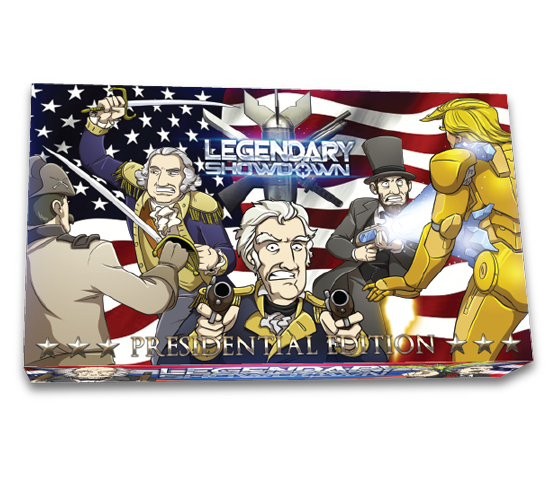 Legendary Showdown: Presidential Edition takes a deep look into the delightfully shady history of the USA, featuring odd presidential facts, historical humor, and characters you will love. Robots, zombies, and super heroes collide in Legendary Showdown: Gamer's Quest, featuring the incredibly popular work of Tim Buckley. This game covers a broad series of genres with jokes that gamers, nerds, and pretty much everyone will love. 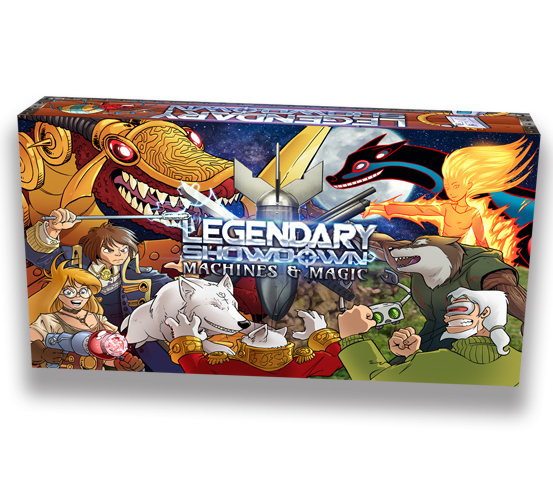 Our best selling game, Legendary Showdown: Machines and Magic combines the award-winning worlds of Gunnerkrigg Court and Girl Genius for the perfect crossover that defies all expectations. Girl Genius provides the game with clever inventions and advanced technology, while Gunnerkrigg Court adds mythological creatures and fantasy elements. It's the perfect combination! The game that started it all! Dr. McNinja's Legendary Showdown features the wildly popular webcomic, The Adventures of Dr. McNinja, written by Christopher Hastings (Marvel Comics Author and Adventure Time Writer). Dr. McNinja and his sidekick (a 12 year old raptor-riding bandito who grew a mustache through sheer force of will) live in a universe where evil unicorns seek to rule the world, Dracula lives on a high-tech moon base, and time travelers are constantly showing up to prevent another world-ending disaster. 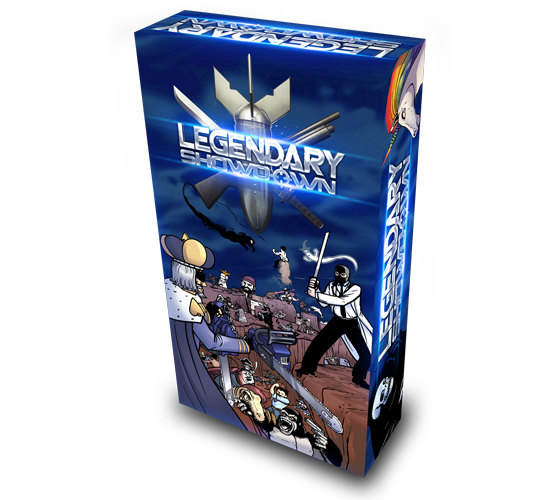 Enjoy the unexpected and totally radical world of Dr. McNinja with a game of Legendary Showdown. "This has become one of my go-to games for introducing people to tabletop games. My coworker who has never played any tabletop games before has become obsessed... He was bummed when he couldn't get a copy for himself, so much so that when the webstore finally opened, he bought 3 copies; one for himself and two as gifts. Get the game, you'll love it." "Every time I've played this game has been a singularly unique experience with hilariously crazy, awesome, and downright ironic scenarios playing themselves out in the most entertaining way possible... This game is easy to learn, yet deep, convoluted, yet quickly understood. And it's for everyone to enjoy." "The game is a blast and is one of the few party games I can pull out and I know everyone will love." 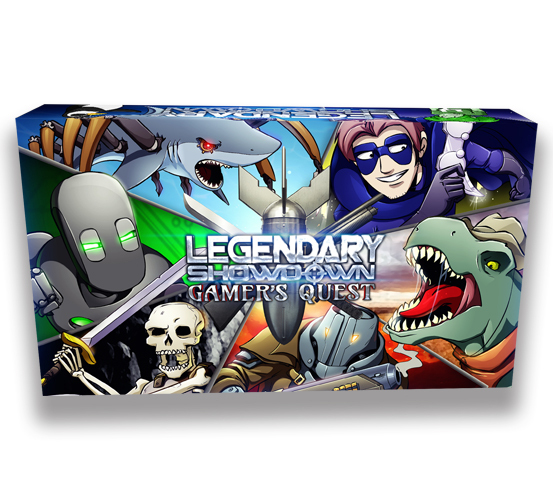 We offer a variety of games, collectors coins, and battle magnets from the internet's greatest webcomics. Products ship from fulfillment centers in several different countries to provide inexpensive, fast, and friendly shipping across the world. Questions, comments, just want to say hello? Send us a message at Team@KillerRobotGames.com. Q: Regarding play order, the rules say that player with the weakest character starts the round. Does this include weapons and bonuses? A: When choosing the weakest character, weapons and bonuses are added to the score. So, a 3 point character with a "Bazooka" (10 points total) is worth more than a 8 point character with no weapons or bonuses, so the 8 point character is weaker and starts first. Q: Does “Just a Clone” prevent the character that is firing “Dracula’s Moon Laser” from being eliminated? A: Yes, if you have "Just a Clone" in your facedown cards, none of your characters will be eliminated that round. Q: If only two players remain, can the first player simply pass and end the game? A: No, every player must have at least one opportunity to play cards or pass before the round ends. Q: Can I use “Let’s Do This… Together!” on an opponent and then use “Dracula’s Moon Laser” to make that player lose two characters? A: Yes! And we highly recommend it! Q: If you are using "Let's Do This... Together! ", can one "Just a Clone" card save both characters? A: Yes, "Just a Clone" card prevents all of your characters from being eliminated. A: The instant or action card which was played first gets discared first, and the second card played ("Greetings from the Future") is discarded second. Q: When the round ends and "Let's do this... Together!" was played, do both move to the back of the line? A: No, only the front character moves to the back of the line. Q: If "Let's do this... Together!" is played on a losing team (thereby eliminating the two front characters) and one of the front characters has the ability to be sacrificed to save another character, can it be sacrificed to save the other front character? A: No, both characters are eliminated simultaneously when the round ends, so the character with the ability has already been eliminated and can't be sacrificed. Q: If "Let's do this... Together!" is played on a losing team, can one character with the ability to be sacrificed to save other characters be used to save both front characters? A: No, sacrificing that character only saves one other character. Q: If the game is ended with “Dracula’s Moon Laser”, who wins? A: If a game ends with total destruction due to “Dracula’s Moon Laser”, all the players who were still in the game tie (although whoever used the moon laser gets bragging rights). A: When choosing the weakest character, weapons and bonuses are added to the score. So, a 3 point character with a "Lightning Stick" (10 points total) is worth more than a 8 point character with no weapons or bonuses, so the 8 point character is weaker and starts first. Q: Does “Revivification” prevent the character that is using “A Whole Bunch of Bombs” from being eliminated? A: Yes, if you have "Revivification" in your facedown cards, none of your characters will be eliminated that round. Q: If the game is ended with “A Whole Bunch of Bombs”, who wins? A: If a game ends with total destruction due to “A Whole Bunch of Bombs”, all the players who were still in the game tie (although whoever caused the annihilation gets bragging rights). Q: If all remaining characters are eliminated with “Hull Breach”, who wins? A: If a game ends with total destruction due to “Hull Breach”, all the players who were still in the game tie (although whoever caused the annihilation gets bragging rights). Is your question not here? Send us a message (Team@KillerRobotGames.com) and we will get back to you. Copyright © 2017 Killer Robot Games. All Rights Reserved.